After participating in some training at the FBI Academy, Kowski became convinced that the NPS needed its own facility to train its rangers, and he began to work toward this goal. 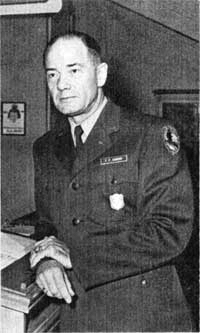 With his enthusiasm and skilled planning Kowski was able to secure support for one of the federal government’s first training facilities, which opened in 1957 in Yosemite National Park under his management. This marked the first comprehensive effort by the NPS to train its incoming uniformed employees (e.g. rangers, naturalists, historians, and archaeologists). In 1963 officials moved the training center to Grand Canyon National Park where the Horace M. Albright Training Center continues to shape the careers of NPS employees. Kowski’s deep concern for the students and staff at the center was well-known, and he later received the Distinguished Service Award in recognition of his important work with and for NPS employees. In 1966, Kowski became superintendent of Sequoia and Kings Canyon, where he remained there for a year. He later served for seven years as regional director for Park Service’s Southwest Region. He was a key figure in consolidating the parks in the Navajo lands into one NPS region, thus improving cooperation with the Navajo Nation. He appointed Native Americans to superintendent positions and provided training and employment opportunities for hundreds of young Native Americans. Generations of young rangers held Kowski in high esteem for his high standards and his depth of knowledge about the art of being a park ranger.